From the 1st of April 2018, the Government’s ‘Minimum Energy Efficiency Standards’ (MEES) be in full force. These Standards will render ‘F’ and ‘G’ EPC (Energy Performance Certificate) rated buildings “sub-standard” for all new leases, renewals and extensions. The non-compliance fines are between £5,000 and £150,000. The enforcement of the regulations is expected to drive ‘soft refurbishments’ around energy efficiency measures. If works devalue the property by -5%. So, by 1st April 2018 all landlords and/or tenants will need to have met minimum standard of ‘E’ EPC, or have registered an exemption. It is the local authorities that will enforce the provisions via trading standards. Further information can be found here. The Government has estimated that ‘F’ and ‘G’ ratings make up 18% of the total building stock in the sector. There are around 75,000 commercial premises with ‘F’ and ‘G’ EPC certificates and a further 65,000 with an ‘E’ certificate. The nature of the legislation and the measures classed as acceptable to acceptable to uplift the EPC rating may cause a delay in new leases being completed or lease renewals being lawful. Ultimately the landlord is responsible for ensuring that the property has a minimum EPC rating of ‘E’ but in reality, for lease renewals or shell and fit out the tenant may be expected to implement the works (and at the very will be affected by the works) leading to confusion and delay. 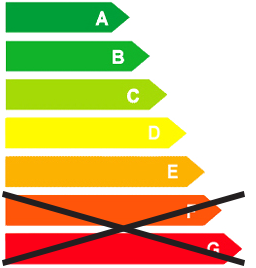 It is well documented that the value of EPCs has been questioned by the industry for two main reasons. First, there has been a number of calculation methodology changes that yield different EPC results. Second, the market has been awash with cheap EPCs with potentially inaccurate results, so the value of EPCs is, unfortunately, uncertain. Air source heat pumps; biomass boilers; biomass room heaters (with radiators); cavity wall insulation; Chillers; circular pumps; cylinder thermostats; draught proofing; duct insulation; gas-fired condensing boilers; ground source heat pumps; hot water showers; hot water systems; hot water taps; external wall insulation systems; fan-assisted storage heaters; flue gas heat recovery devices; heating controls for wet central heating systems or warm air systems; heating ventilation and air-conditioning controls (including zoning controls); high performance external doors; hot water controls (including timers and temperature controls); hot water cylinder insulation; internal wall insulation systems (for external walls); lighting systems, fittings and controls (including rooflights, lamps and luminaires); loft or rafter insulation (including loft hatch insulation); mechanical ventilation with heat recovery systems; micro combined heat and power; micro wind generation; oil-fired condensing boilers; photovoltaics; pipework insulation; radiant heating; replacement glazing; roof insulation; room in roof insulation; sealing improvements (including duct sealing); secondary glazing; solar blinds, shutters and shading devices; solar water heating; transpired solar collectors; under-floor heating; under-floor insulation; variable speed drives for fans and pumps; warm-air units; waste water heat recovery devices; water source heat pumps. It is recommended that property managers should schedule lease renewal dates, the lodgement and rating of all EPC’s, and consider implementing the following action plan. Review the portfolio lease renewal key dates and develop a forward masterplan for the period 2018 to 2023.
Review existing asset management plan to ensure that there is a linkage to all planned projects (refurbishments and planned maintenance projects) against EPC uplift requirements. Establish the validity of the existing EPC ratings – are they correct and accurate? Carry out additional or new EPCs to flush-out any suspect EPCs. Set targets – should the target be for minimum standards at ‘E’ or should the target for a better EPC be set to account for potential future changes in the minimum requirement? Undertake portfolio risk management around the MEES legislation and categories of properties. Ensure that a techno-economic evaluation is undertaken. Consents and legal – Ensure that the red tape is suitably addressed, especially the complex area of who is funding the project and who is benefiting from energy savings (Tenant or Landlord). Risk management strategy – Developing this will identify risks and how they are to be managed throughout the process. Develop the technical specifications to deliver the energy savings. This will include a package of project preliminaries, technical specifications, drawings, risk assessments etc. Tender Action – to ensure that the best value is obtained from the supply chain in terms of value for money, ensuring that the service level and adherence to specifications and financial value are all understood and measured. Implement – ensuring that minimal disruption is made to the building operations. Commissioning – this is a very important part of the project to ensure that the systems are set up correctly and that value is derived from the installations. Training – to ensure that building operations can correctly use the new system changes and indeed that misuse does not creep in. Measure energy impacts at 3, 6, 9 and 12 months, allowing the opportunity to re-tune systems if they need it. Verify the savings at 12 months and compare against the original business case.